Background: In pharmaceutical research drug discovery and development process is timeconsuming and expensive. In many cases, it produces incompetent results due to the failure of in vitro and in vivo conventional approaches. Before any new drug is placed in the market it must undergo rigorous testing to get FDA approval. Due to the several limitations imposed by the drug discovery process, in recent times in silico approaches are widely applied in this field. The purpose of this review is to highlight the current molecular docking strategies used in drug discovery and to explore various advances in the field. Methods: In this review we have compiled database after an extensive literature search on docking studies which has found its applications relevant to the field of formulation and development. The papers retrieved were further screened to appraise the quality of work. In depth strategic analysis was carried out to confirm the credibility of the findings. 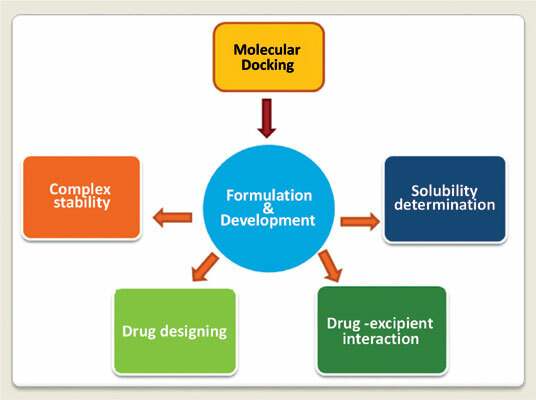 Results: The papers included in this review highlight the promising role of docking studies to overcome the challenges in formulation and development by emphasizing it’s applications to predict drug excipient interactions which in turn assist to increase protein stability; to determine enzyme peptide interactions which maybe further used in drug development studies; to determine the most stable drug inclusion complex; to analyze structure at molecular level that ascertain an increase in solubility, dissolution and in turn the bioavailability of the drug; to design a dosage form that amplify the drug discovery and development process. Conclusion: This review summarizes recent findings of critical role played by molecular docking in the process of drug discovery and development. The application of docking approach will assist to design a dosage form in the most cost effective and time saving manner. Molecular modelling, drug discovery, molecular docking, formulation and development, pharmaceutical research, molecular modeling.